This was one of the most requested features since the last post and I decided to give it a shot. I have some other improvements&fixes as well but let’s do it in bullet style again, it’s so much easier for me that way. -Offline Maps; well yes the big thing is the offline maps this time. Admittedly I just did a simple basic implementation for now, as it’s a huge topic itself, didn’t had time to do a complex complete implementation. Anyway, how it works; first of all, all you need is to use “CachedDynamicLoader”. That’s all. This script has a simple caching system; every time it needs to load a tile, it first checks if it exists in a predefined folder. If it’s there, it just loads the file and reads the Mapzen data from that, if not it requests the data from Mapzen api and then saves it in that folder for later usage. Want to test it? You should run the “CachedDynamicLoader” scene and run around a bit. In this initial run, there will be nothing cached so it’ll load everything from server BUT it’ll also save them as a file. Notice how long it takes to load single tile. Now restart the game, you can even unplug your internet connection at this point, and this time, it’ll load everything from file system, much much faster. But be careful, there is a little unsolved (for now) issue here; it takes so little time to load data from file so it’ll try to load and create all tiles at once, which will most likely freeze the editor. I’ll look into this in the future, for now try to stick with range 1 or something small like that. So yea, it’s far from done for now but it’ll only get better. It’s on this update so that you can work on it as you want as well. -Next… well there is Road settings things I did today. If you check the road factory, you’ll see the settings property is quite extended now. It has an array of RoadSettings, where you can choose the road type (path, minor road, major road etc), road width and material.With this, it’ll be so much easier to change any settings in game. It’ll also easy to extend settings for more road types and options as well. I’ll try this for a while and if it works out well, I’ll do the same for other factories as well! -Then we have real building heights. I honestly thought I did this long ago but… well turns out I didn’t. It’s a small thing really, building factory now checks if the building has height property set, if it does uses that, if not takes a random number. That’s all. -Also fixed some issues from Github page here. I’m also posting there on daily basis so please, don’t be shy to open new issues for bugs or feature requests. It’s much easier to discuss things there and I have 16 closed issues so… yeay!!!! Yep, that’s all for this update I guess. Please do let me know what you think. I’m trying to build my road plan according to feedbacks, feature requests and bug reports. Hey everyone, it has been a while but here I am with a huge update; single mesh layers, continuous roads, water&parks and more! First of all, yea I know I shouldn’t be doing such huge updates and refactoring but I couldn’t help it this time. I got greedy and keep adding stuff. I’ll try to post smaller stuff more frequently from now on. I’m also sorry for the huge refactoring going on, it’s probably break everything if you built your stuff on previous versions but, trust me, totally worth it! 1) Single mesh layers is easily the biggest thing in this post. As you may remember, every single entity was a separate GameObject before which caused horrible performance and fps. I was having issues even with 9 crowded tiles (see Paris) using that method. What I did was simply merging meshes of same type entities under one single gameobject. For example, all buildings in a tile is single GameObject now. Or all roads, or parks. 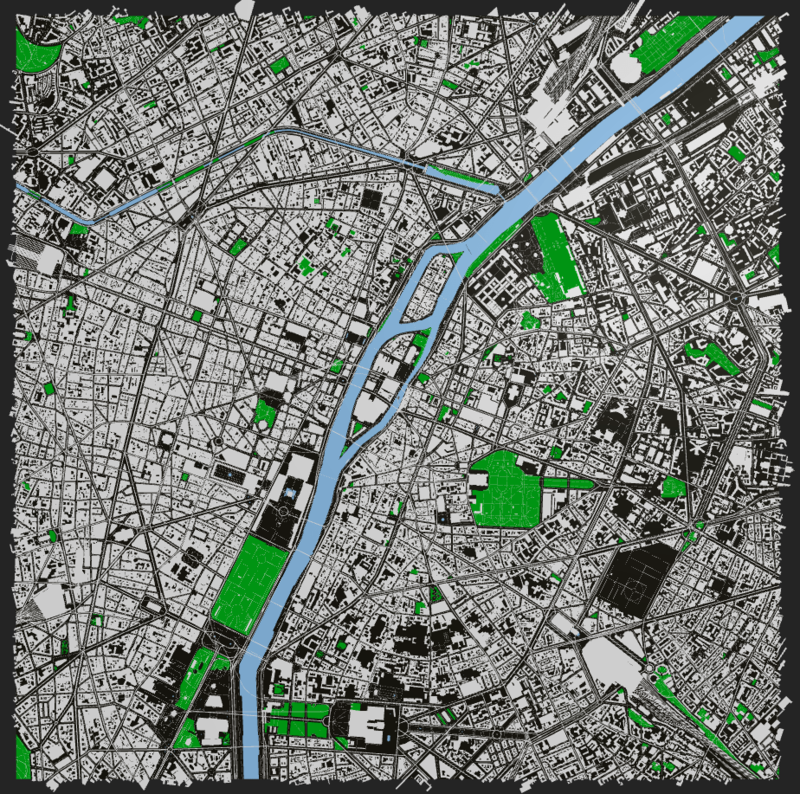 So instead thousands of small gameobject in every single tile, we have 4 now; Buildings, Roads, Water, Parks. What’s the catch? Well you won’t be able to click&select buildings anymore. If you were planning anything like that, it might be better not to use layers (or handle click position and building relations differently in the background). And the tile creation is NOT threaded yet so it’ll stutter a little during the initial loading process. I’ll look into that as soon as possible as well. Oh and you can activate/deactivate this thing from World Settings so you can still stick with the old system if you want! 2) Continuous roads. Well not too continuous though. Let me explain; Mapzen road data is kinda hard to work with, it’s not a graph, not even properly connected. It’s just a bunch of, disconnected, unrelated road segments. So about continuous roads, yea it’s quite easy to make those road segments continuous, sure but almost impossible to create a connect all those segments, create a graph and smooth all together. OK, not impossible but not an easy task either so I’ll skip that for now. As you can see, segments are continuous now but connections between segments still looks ugly. And yea it’s not smoothed either but it’ll be quite easy now that we have them in one piece. 3) Major refactoring. I really hate making big refactoring sessions like this but I really had to this time, mainly for layer things. Right now, building, water, road class are just keeping data. Removed all mesh generation code from those and moved them to factories. Admittedly it should have been like them from the beginning… my bad. But anyway, this new structure should be much better now. There is still some stuff to do there, but hopefully, won’t be this big. 4) Landuse layer! 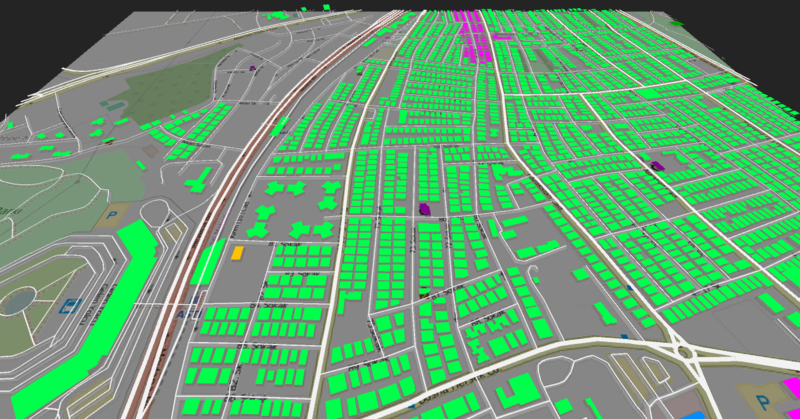 I almost forgot that but yea, we have a landuse/park layer now. 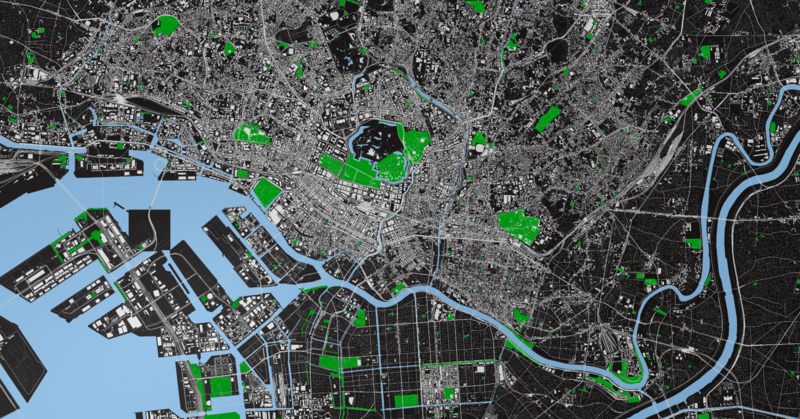 Landuse layer has quite different stuff in there, bridges, parks, residential zones etc. I decided just to go with parks at the moment, as others made the general look messy. You can tweak it as you like, please let me know what about your work as well! 5) Also fixed some issues from Github Issues page. You can always post your reports/requests there as well. I’m actively using it! Guess that’s it for now. Just run the sample and walk around Paris, you’ll see it’s soo much better than previous versions. I really hope you’ll like it as well. Sooo what’s next? Not sure really, threading, visual improvements, more layers, custom objects, GPS, android build…. There is soo much to do and I’m quite sure I’m forgetting lots of other stuff. I’ll try to decide&post what’s next as soon as possible. Please let me know what you think of this series, if you like it or not, if it’s useful for you, anything really. Welcome back to the fourth part; Water layer, Git page, bug fixes and more! -First of all, I finally created a git page for our little PokemonGo clone! You can find the latest fixes and updates, file bug reports, post feature requests there. I’ll be using it extensively so have no worries or hesitations about post there as well. -Then we have some bug fixes. Previous versions didn’t really work properly in different detail levels for example. New tiles positions were messed up as well. They should be all fixed up now but yea, didn’t had time to test it extensively so please do let me know if you stumble upon anything weird. You can also read commit logs for more, I’m trying to write everything down properly there. -There is also a parameter for tile sizes now. As you may remember, tile sizes wasn’t controlled in previous versions which caused countless problems. i.e. Lvl16 tiles were 611 unit wide while Lvl14 tiles were 2446 unit wide. Now we have a “TileSize” property under the world script, scaling down/up everything to fit tiles into that width&height. -Last but not least, we now have a working water layer! It was a little tricky as there are lots of “MultiPolygons” in the water layer but turns out it isn’t that hard after all. I just did some silly mistakes which confused for a while. It happens. Occasionally. Sometimes frequently. But yea, with that fixed, we have a quite smooth water layer now. I just put a simple blue polygon for water but you can put Unity3D water over that easily. Yes, that’s Istanbul for you! Looking good? Nope? Yeah…. Hmmm am I missing something? Well it’s all on Git now, you can check all commits and commit messages for more. You can also check GitHub Issues page for known issues as well. I’m actively adding stuff there as well. And that’s it. I guess. Please do let me know what you think about it or have any questions. Your feedback is what keeps me going. And page hits, share it will you? Thanks! As you may know, we already created a basic tile loader , player character and 3D buildings in the first two posts. Now we’ll try something a little more different, a dynamic tile loader. Admittedly I had no idea what to call it, “dynamic” might not be the best word here but couldn’t come up with anything better (and I’m open to suggestions). But it’s something that loads tiles dynamically…. well no. Whatever. So what’s the problem we’re trying to solve here again? Well, Basic Loader gave us a central tile and n other tiles around it depending on the range parameter. But that’s a (quite small) finite set of tiles and you will eventually run off the map if you run in the same direction for a while. We’ll take the most straight forward way to solve this; extend the world as player character gets close to any edge. There are lots and lots of different ways to really. I mean, how to detect player is getting close to an edge, how to load tiles or how many tiles to load etc. They’ll all have different properties and side effects but I think I’ve chosen one of the simplest ways and will try to explain it in detail now. Looking good? So let’s start! We’ll pull a little trick here.. but let’s do it like this, what happens if the player character moves in a direction for hours? It’s a big big world as the songs says eh? 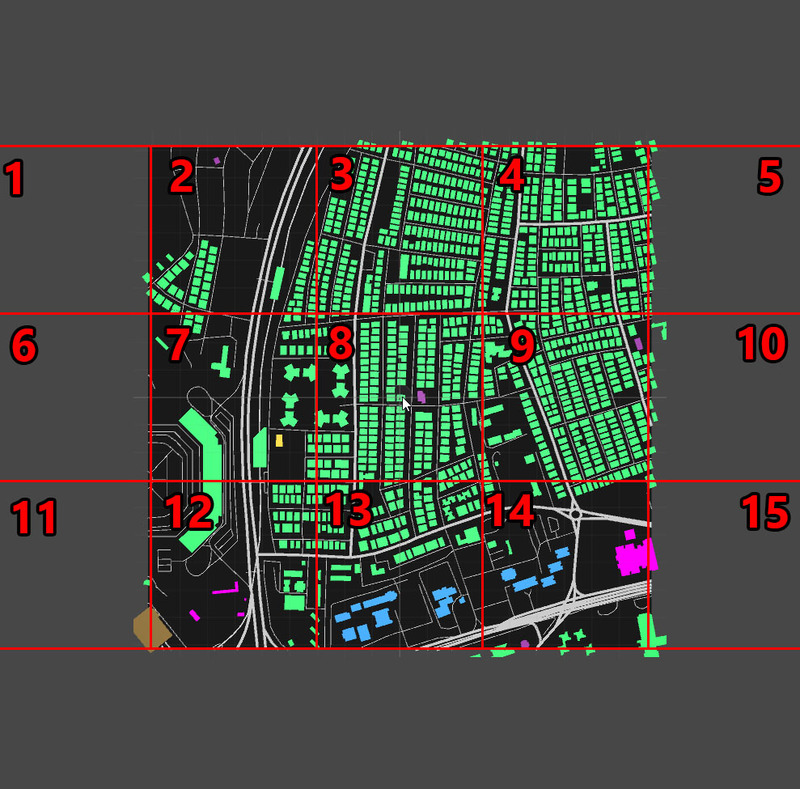 Position vectors (of player, tiles and buildings) will grow and grow which will cause lots of precision problems after a while (7 digit numbers). So once player character leaves central tile, we’ll assign new tile as the central tile and move it back to (0,0) with everything around it. Doing this, everything will be kept around (0,0) all the time (see Centralize method) and with everything moved in one frame, you’ll nothing absolutely nothing at all on screen! So now we have everything in the (0,0) again. Now we can create new tiles using the very same function we used for basic loader. Remember we had 8 as central tile and loaded other around that? When the player moves to Tile 7, it becomes the new central tile and we’ll load neighboring tiles 1,6,11. Simple eh? One last thing, we don’t want to end up with hundreds of tiles on screen right? This is totally up to you actually but I’ll just assume that ,tiles further away more than d (from central tile in manhattan distance) are unnecessary, and simply destroy them (see UnloadTiles function). I guess that’s all for now, had a lot more to talk about but it was a long day and I’m very very exhausted at the moment. I hope it’s still readable, I’m not even sure what I’m doing at this point. I’ll try to post something like a todo list soon, consist of possible improvements on this. Will also post it on Github as soon as possible. Hope you like this little dynamic tile loader thingy, let me know what you think! Edit: There is a bug with the tile colliders at the moment. It collides with the player character, preventing him to move. I’ll fix and reupload it asap but untill then, you can simply move tile collider (big cube in (0,0,0)) to another tile and change “Layer Collision Settings” to prevent it colliding with anything. I did it like that but turns out “Layer Collision Settings” or even layers aren’t included into unitypackages. I’ll (hopefully) fix it in a few hours. In this second part, I added a player character and 3D buildings to our cute little PokemonGo clone! It’ll be a short post really. I used the Ethan model from “Standard Assets” package. All I did was importing the package, simple as that. It works with WASD controls at the moment as that’s the easiest way to navigate during development process but I implement GPS coordinate based movement in the future as well. 3D buildings was even in the previous package actually. I somehow forgot it in there but the building heights was set to zero so it was quite hard to notice it. Anyway I fixed the bug and the code itself for better looking buildings. Just better, not beautiful… but we’ll get there, slowly. Generation code is quite straight forward but still I’ll try to explain shortly. As you know from previous post; CreateMesh() function in the Building class takes the building corners as a List<Vector3> called verts. Those vectors (coming from Mapzen Api), or lets say the polygon generated from those vectors, gives us the base of the building. What I did was, to generate that polygon in the air and use it as a roof. Then for every edge in the roof, I created a side wall down to y=0 and viola! This yields quite simplistic, bare bone buildings as seen in PokemonGo. Should be enough for now but might give BuildR a chance in the future as well. With character movement working, we have a new problem at hand; player can actually run to & fall off the map. We’ll fix that in the next post, by creating & loading new tiles dynamically as the player moves.